The Morris Owner and Nuffield Mail magazine, 1944. Homepage. This page: An issue of the Morris car company's in-house magazine, printed during WW2. The Morris Owner and Nuffield Mail. 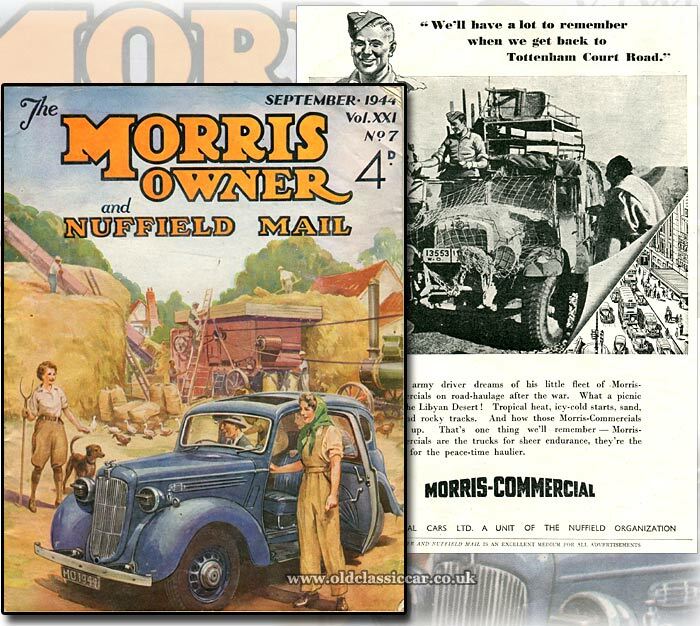 Previously just titled The Morris Owner, by 1944 - the date of this wartime issue - the company's magazine title had been altered to become The Morris Owner and Nuffield Mail, following the establishment of the Nuffield Organization in 1943. 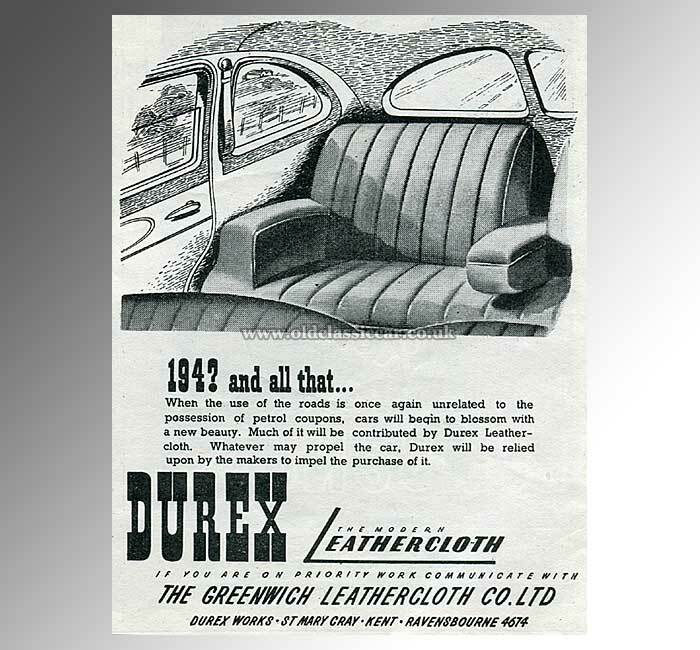 After just a short period of time, the group had a number of companies incorporated within it, including familiar names such as Morris Motors Ltd, Wolseley Motors Ltd, MG Car Company Ltd, S.U. Carburetter Company Ltd, and Morris Commercial Cars Ltd, to name a few of the better-known organisations. While motoring was little more than a pipe-dream to many car owners, forced to take their vehicles off the road for the duration of the war, optimism for the future can be found throughout this rare magazine's pages, in articles and advertisements alike. While the end of the war was still some way away, thoughts were definitely turning to how Britain, post-war, could return to some level of normality. This copy was published for September 1944, three months or so after D-Day had taken place. It would also be the month that V2 rocket attacks on targets across Europe, not least London, commenced. While the Germans were on the retreat by this time, the future of Britain was still far from assured. Two ladies of the Women's Land Army, often referred to as Land Girls, feature on this issue's cover, with a cheery farmer shown sat behind the wheel of his Morris 10. Note the blackout masks fitted to the Morris' headlamps. 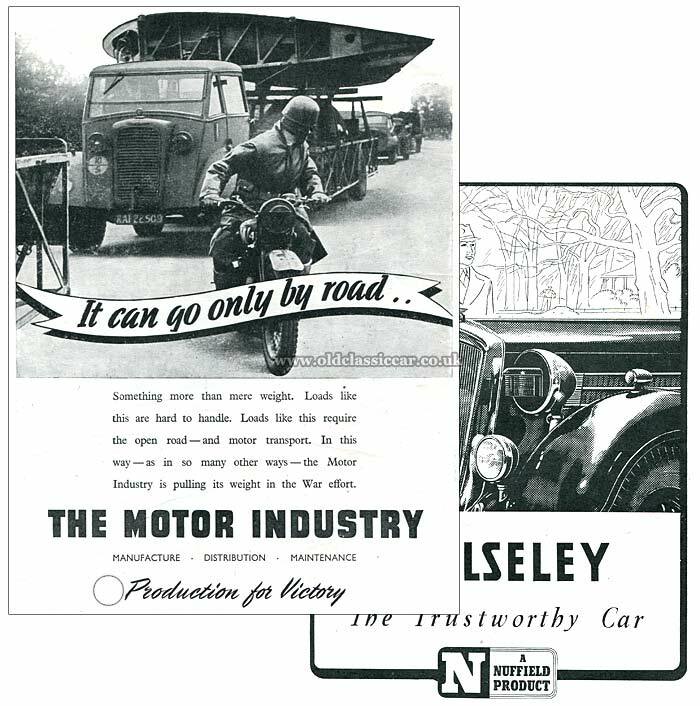 A one-page advertisement for Morris-Commercial lorries is a classic example of a company, involved in wartime production for the allied forces, looking ahead to a post-war world. Here, an army driver dreams of a future where he owns a fleet of Morris Commercials, employed in the road haulage industry. The opportunity to point out that these dependable vehicles, driven in harsh conditions throughout the war, ones that will continue to offer these benefits to post-war operators, isn't overlooked. Indeed, many ex-services vehicles, and servicemen, would end up employed in civilian road haulage to earn a living after the war had ended. 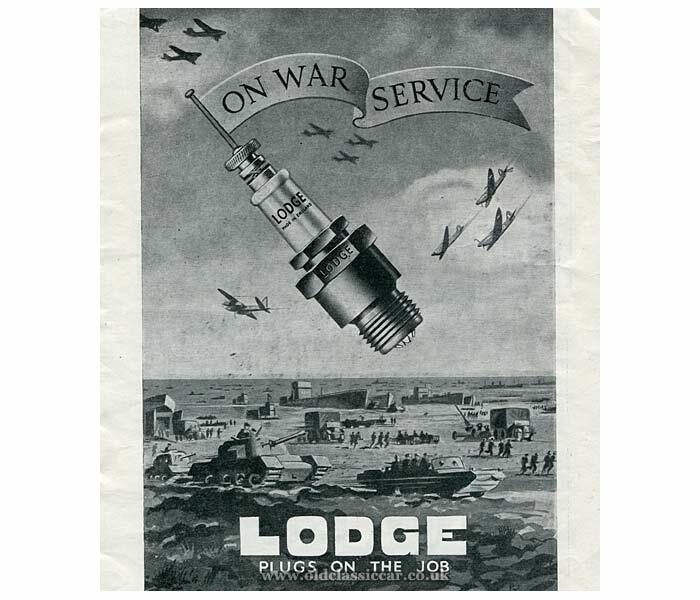 Advertisements for a diverse assortment of products, such as Lodge spark plugs, Eccles Caravans, Masteradio in-car wireless sets, and Exide batteries, employ a similarly optimistic tone. The dignified Wolseley marque, as you might expect, keeps things simple and merely reminds readers of its existence. A rather more eye-catching page though, highlighting the contribution made to the war effort by the motor industry as a whole, is altogether more imaginative. In it, a pair of wartime lorries in RAF service (built by arch rivals Commer, part of the Rootes Group) tow "Queen Mary" trailers loaded with aircraft parts on them. Often wings would be transported with their leading edge lowest, here though they're being moved in a horizontal position. Their width required the use of an escorting motorcyclist, also shown. "Although it is to be hoped that the authorities will be able to offer some relaxation of the lighting regulations, there will still be many districts where masks will be required. To obtain the maximum permissible illumination, therefore, with the approach of early hours of darkness, now is the time to free the mask apertures and diffuser screens from the Summer's accumulation of dust and flies." As the supply of new cars for civilian users had all-but dried up for the duration, there are no new-car roadtests to be found here. Instead, various articles discuss things to do with your existing motor - all this assumes you could actually get sufficient petrol, or "motor spirit", to actually go anywhere. Over two pages are given to the subject of economical motoring, and how best to achieve it. "Like many motorists in peace-time, I have always carried a camera and a pair of binoculars aboard my car. The war was still young when I locked my camera at home, not so much because of the price and scarcity of films as for fear of falling foul of suspicious sentries and policemen, since one never knew when the casual snapshotter might be within range of some secret installation. But I had a narrow escape with the binoculars early in June." "Chancing to pull up in a coastal area I noticed a W.R. policeman gazing rather sourly through a side window of my stationary car. Following his eyes I saw they were fastened upon the leather binocular case in the dash cubby hole. I had actually been wondering whether it was safe to use them on the shipping in the bay. After a second of rather nervous hesitation I took out the case, avoiding the policeman's eye. With an air of extreme rectitude I walked around to the tail of my car, placed the case inside the boot, and relocked it. Then I faced his eye. 'Very wise, sir' he remarked. 'I should leave those at home if I were you!'. They joined the camera in a drawer that evening." Information regarding many more magazines from yesteryear, not least a 1938 copy of The Morris Owner, may be found in the car magazines section, here at Old Classic Car.